Great Lakes Wholesale Group strives to bring you the best health care items at the best price, so you can keep your customers happy and healthy. We offer a wide variety of medications, vitamins and first aid supplies; everything your customer needs for their healthy lifestyle. These items are necessities that will keep customers coming back year round! Some of our most popular items include Health Care OTC Medications, Sheffield Ointments, Natures Benefit Vitamins, Coralite Bandages, Swan Rubbing Alcohol and Peroxide, Femtex Brand Tampons and much more! 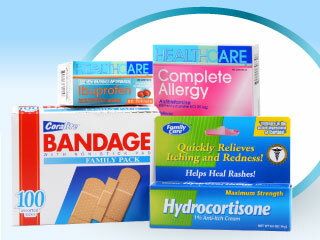 To review our entire Health Care selection, click on ANALGESICS below to start browsing.